Bertha Carter, wife of William Carter who was the first director of the Center for Latin American Studies at the University of Florida from 1969 to 1977, spent many years in the lowland tropical rainforests of Sarapiquí, Costa Rica assisting my mother, Giovanna Holbrook, in pioneering the creation of the first eco-lodge in that region, Selva Verde Lodge. After Bertha Carter's husband died of cancer in August 1983 she set up a Hispanic Scholar In Residence program as a memorial to her husband at the University of Florida. Beginning sometime around 1984, she moved to Costa Rica and installed herself in a house on the Selva Verde property. At that time, the road to the area was not paved and this region, still today considered somewhat of a frontier, was with large tracts of rainforest interspersed with rural villages. It was remote. There, she acted on behalf of my mother obtaining all the documents and legal status for the Lodge and then managed the budding ecotourism enterprise that she was instrumental in giving shape to. As a woman from Bolivia, Bertha had a great deal of understanding about the local culture and yet she was also outstanding with her interest in helping local women gain empowerment and independence. She once told me that during her time managing Selva Verde Lodge, she quickly established a rule that only the staff member would be permitted to retrieve their paycheck. This prevented the husbands from collecting their wife’s paycheck and taking total control of the household money, which was seemingly common practice. In so many ways, Doña Bertha was a leader to the women in the area. In addition to helping women in Sarapiquí, Doña Bertha took a special interest in helping the young naturalists in the area. At that time, Selva Verde Lodge attracted many scientists, biologists, and conservationists as our guests. Bertha made a point of introducing these guests to the local naturalists so that there could be learning, opportunity, and exchange between the parties. This practice truly helped many budding local naturalists spread their wings. Paco Madrigal was a young man whose parents were staff at Selva Verde Lodge and who was a neighbor of the Lodge. Today people like Paco, owner of Cotinga Tours, one the most important birding tourism companies in Costa Rica remember that Bertha was their ally and supporter in their personal and professional growth. This interest in offering educational opportunities to the youth in the area reached a new level when Bertha had the idea of starting a library in Sarapiqui. Her friendship with Jaime Alvarado, a native Sarapiqueño who founded the group JADE (Joventud Activa Desarrollo Educativo / Active Youth for Educational Development) was how she was introduced to another need for the community; JADE's mission was to implement a library in Sarapiqui with a focus on textbooks for students in the area. The cost for these required books was often the deciding factor of whether or not families could send their children to school and they wanted to alleviate that burden. These two parallels came together: Bertha's interest of creating a space for women's empowerment and of JADE's goal of acquiring learning materials for the community. Another key figure in the creation of the library was Betty Ann Knudsen. In 1978 Betty Ann became the first woman to chair the Wake County Board of Commissioners in North Carolina and she worked to consolidate the independent municipal libraries into one county-wide library system. Betty Ann was also very active in many women’s organizations. She served as President of the Women’s Forum of North Carolina and in that position was a prime mover in the establishment of the NC Women’s Resource Center and the NC Women’s Legislative Agenda, which determined legislative issues for which women lobbied the General Assembly. From 1988 to 1996, Knudsen and her husband, Pete, lived on the 600 acre Selva Verde reserve in Costa Rica, where they accumulated a large butterfly collection and trained people to raise tropical butterflies. 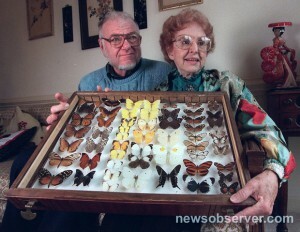 Their Lepidoptera collection now makes up the Peter and Betty Ann Knudsen Butterfly Exhibit at the North Carolina Museum of Natural Sciences in Raleigh. Betty Ann loved collecting butterflies, earning her the nickname “Butterfly Lady.” Peter cultivated a butterfly garden and was the resident naturalist for the Selva Verde Lodge. Betty Ann managed the gift shop at Selva Verde and sold crafts mostly made by the native women. Using her architectural talents she designed the community center and library incorporating Jaime’s design for a stage. In 1993, together with my mother, Bertha Carter, Betty Ann Knudsen, and Jaime Alvarado, the collaborate dream of having a library and resource to support education in the area was realized. Through donations from Selva Verde Lodge, the construction company that built the Lodge (Resenterra S.A), and plans donated by then Dean of the School of Architecture at UNC, the building was completely established. Today, that library is now the Sarapiqui Conservation Learning Center (SCLC) or Centro para la Enseñanza y Conservacíon de Sarapiquí (CECOS). 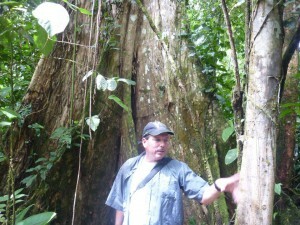 The Center is very active today and its programs have helped countless children, young adults, and adults realize a greater potential and learn about the importance of the unique rainforest environment of the region. Its programs include a scholarship program in which youth in the area can qualify for financial assistance to attend and complete their high school studies. This program has helped over 250 students who would have likely been compelled to drop out in order to help their families economically. Another flagship program of the Center is the English as a Second Language program which helps young people in the area to learn vital skills. There are countless ways in which the Center has helped the region as well as those international students that volunteer at the Center and are the “manpower” of the staff. The original idea of Doña Bertha of exchange of time, talent, and treasure is what make the Center tick.